Columnist and TV personality Ramon Tulfo had an encounter with couple Raymart Santiago and Claudine Barretto yesterday at NAIA Terminal 3. According to reports, Ramon Tulfo witnessed Claudine Barretto flaring up at a Cebu Pacific staff after Barretto learned that her baggage was missing. 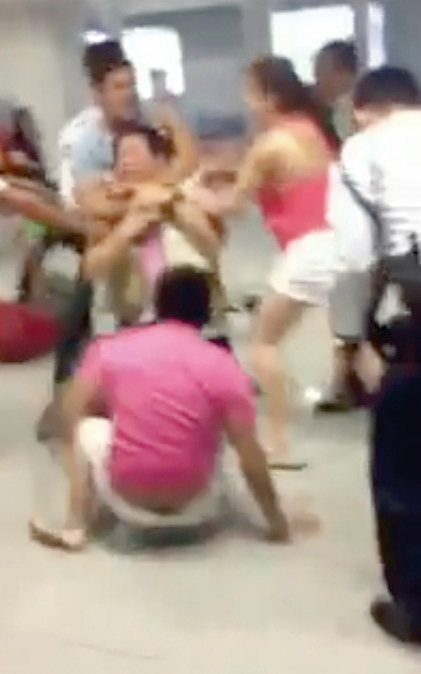 During the incident Tulfo recorded what was happening on his phone. When Barretto's husband Raymart Santiago noticed the recording, he rushed and attacked Tulfo. Two versions of the story have circulated. One version is that Tulfo attacked Raymart and Claudine while the other version Raymart attacked by Tulfo. 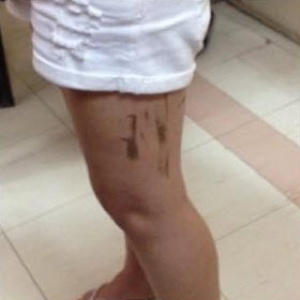 Photo of Claudine's bruised leg was posted in Twitter to prove she was kicked by Ramon Tulfo. In the other photo, Ramon Tulfo was being mugged by an unknown man from Raymart and Claudine's entourage. This entry was posted on 9:28 AM and is filed under Claudine Barretto , Philippines , Ramon Tulfo , Raymart Santiago . You can follow any responses to this entry through the RSS 2.0 feed. You can leave a response, or trackback from your own site.